Thanks to the students of Canmore Collegiate! We received this note just a few days ago. Club Green will be following the progress of their project right here >>. Here’s what they had to say about helping out! Canmore Collegiate High School, nestled in the beautiful Rocky Mountains of Alberta is home to a group of dedicated students under the name of Club Green. 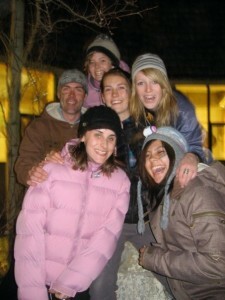 Our main project last year, April 2009, was called Camp Out for a Cause. We raised money for The Water Project to build a fresh water well in an African community. We put out coin collection jars around town, received pledges from friends and family and to raise the most money we camped in an outdoor sanctuary in our school for 24 hours. It was late in April when we did this so weather was not ideal…exactly what we wanted to raise money!! While we were in the middle of the circle (what we call it at our school) we picked up trash, dead growth and did some landscaping to help improve the vitality of it for the coming spring. It was a success! Our goal was $3000 to build a whole well, in the end we only made $1800 which was a lot short of our goal but we were very happy with the outcome. The money will go to help provide fresh water in an African community through a well being built. Thank you for everything you do, it’s an extremely important cause.